C2C’s Fire Disaster Recovery Workshop on February 6-7 left us with three valuable lessons. Fire moves in unpredictable ways–often with strange results. The outcome of the Buxton controlled burn on the contents of a metal storage cabinet offer an interesting illustration of this lesson. The cabinet’s doors were slightly ajar (deliberately) for the burn event. John Campbell, Director of Collections at the NC Museum of History, led the recovery effort in this area and found objects coated in soot and ash, including a rolled textile wrapped in tyvek and several brass items. Surprisingly, as Campbell lifted an apple-shaped bell in order to move it to a work space, a pile of ash dropped from its interior. Our group learned that sometimes, small whirlwinds form within fires and the base of the bell must not have been quite plumb against the shelf. A whirling motion likely resulted and sucked ash into the bell’s chamber. 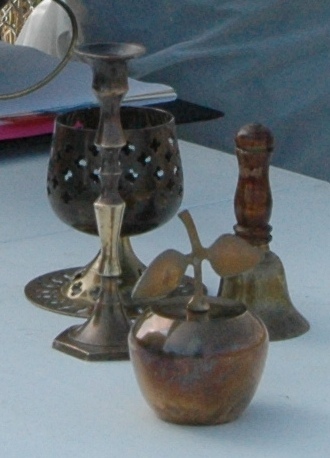 Ultimately, the brass objects withstood the fire and could be set aside during the triage process for future cleaning. 2. Storage containers offer crucial protection. 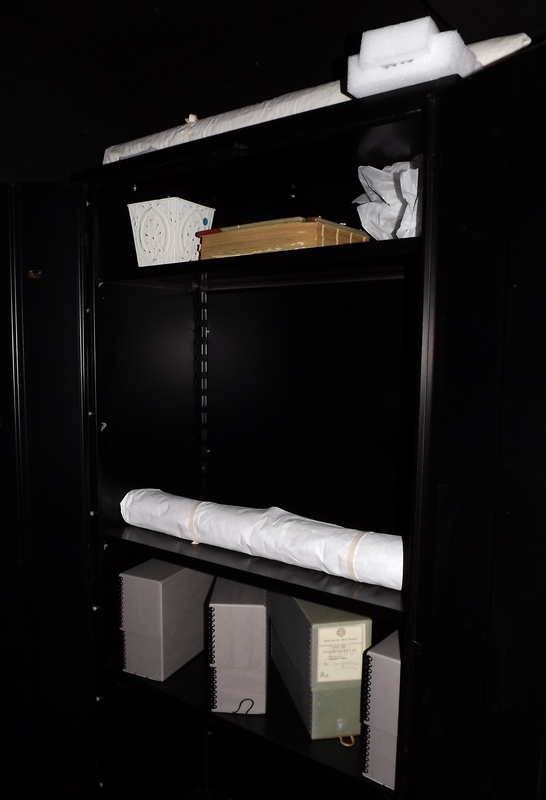 Our “museum” had loose books on shelves as well as other objects in a variety of containers including garment bags, document boxes, and an exhibit case. In one area, four garments hung from a rope–2 uncovered, 1 in muslin, 1 in tyvek. The uncovered jackets had significant accumulations of soot and ash, which would have required a great deal of recovery work. The two covered pieces were well protected; muslin and tyvek functioned equally well in this fire scenario. 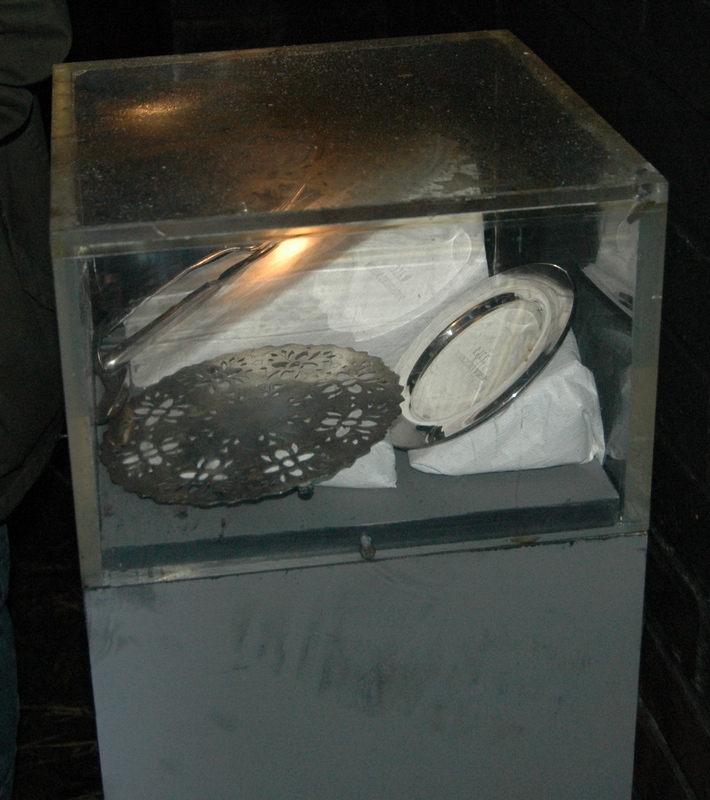 Similarly, silver plate objects on ethafoam mounts inside an acrylic-hooded exhibit case were well protected from the fire’s effects. In another instance, a rolled textile with a reemay cover rested atop ethafoam brackets on a wood shelf. The exposed ethafoam melted slightly and browned like roasted marshmallows. The reemay, a sparsely spunbonded polyester material, let in trace amounts of soot on the textile’s outer layer, but still offered some protection. 3. The type of container affects the level of artifact protection. During the controlled burn our staff tested 3 types of storage boxes (blueboard, microchamber, and polypropylene) and other preservation materials. In one pair of blueboard boxes, metal items were wrapped with corrosion intercept. The copper on left was in a standard archival blueboard box. The copper on the right had been wrapped with corrosion intercept. Note the color difference. Bent copper sheeting in the standard blueboard boxes showed some discoloration after the fire. 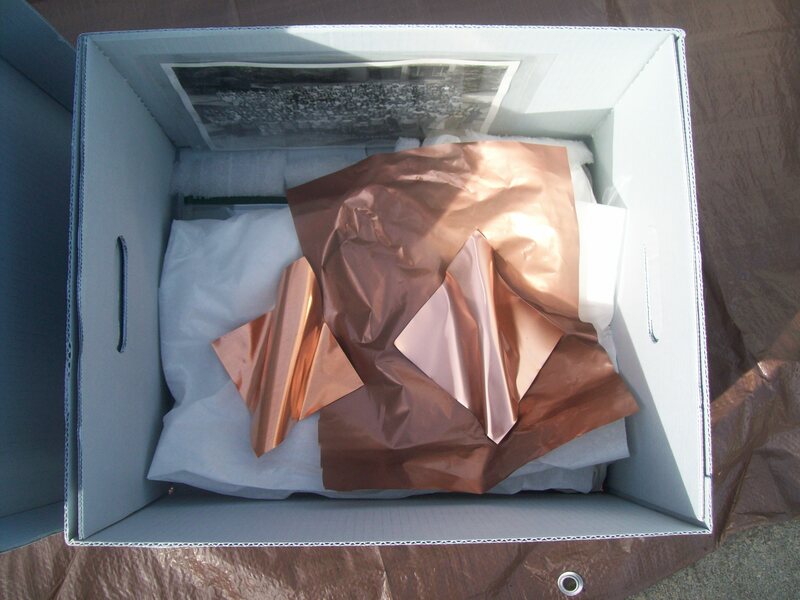 In contrast, the copper wrapped with intercept, the copper inside the microchamber boxes, and the copper inside the polypropylene boxes were equally bright. These materials all offered an extra level of protection. The polypropylene (sterilite) boxes we purchased were much less expensive than the pollutant-adsorbing materials and containers. Their low cost and extra protective qualities are advantages to keep in mind. However, melting may be an added risk for this container material. During our test these materials were not in the path of the fire. The heat in the room with the test boxes was well over 100 degrees for two hours, with a peak temperature of 700 degrees. The poly boxes showed no evidence of melting, although mylar encapsulation materials inside the board boxes and the corrosion intercept film showed areas of discoloration–likely from the high heat. Would polypropylene boxes hold up as well as board boxes if they were in the fire’s path? Or would they melt and leave artifacts inside irrecoverable at temperatures that board containers could remain intact? Perhaps further testing will provide answers. Posted on February 21, 2012, in cleaning, collections care, Connecting to Collections, disaster preparedness, storage, workshops and tagged corrosion intercept film, ethafoam, John Campbell, Microchamber board, reemay, sterilite boxes, tyvek. Bookmark the permalink. Leave a comment.